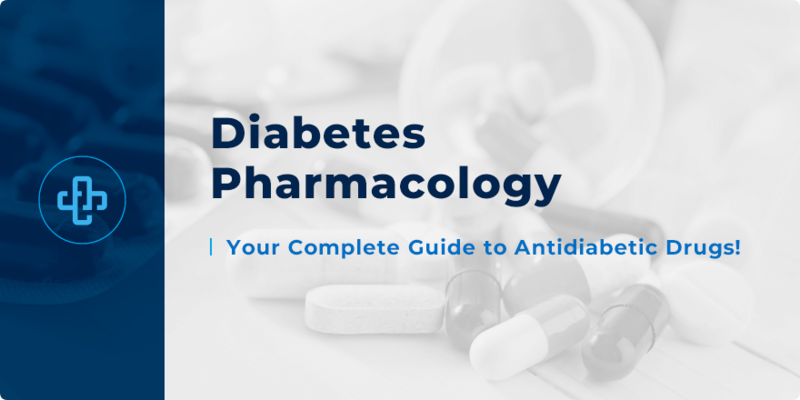 Diabetes Pharmacology | All the Facts in One Place! Diabetes affects more than 30 million people throughout the United States. Millions more are thought to have the condition but are currently undiagnosed. With an obesity epidemic growing at an alarming rate, these statistics are expected to rise precipitously in the coming years. Diabetes management is about more than medicines, though. Lifestyle factors and exercise play their role, too. Here, we focus exclusively on the medication dimension; drug classes used in the treatment of type 2 diabetes. While there is no cure for type 2 diabetes, treatment aims at reducing complications, both short and long-term. 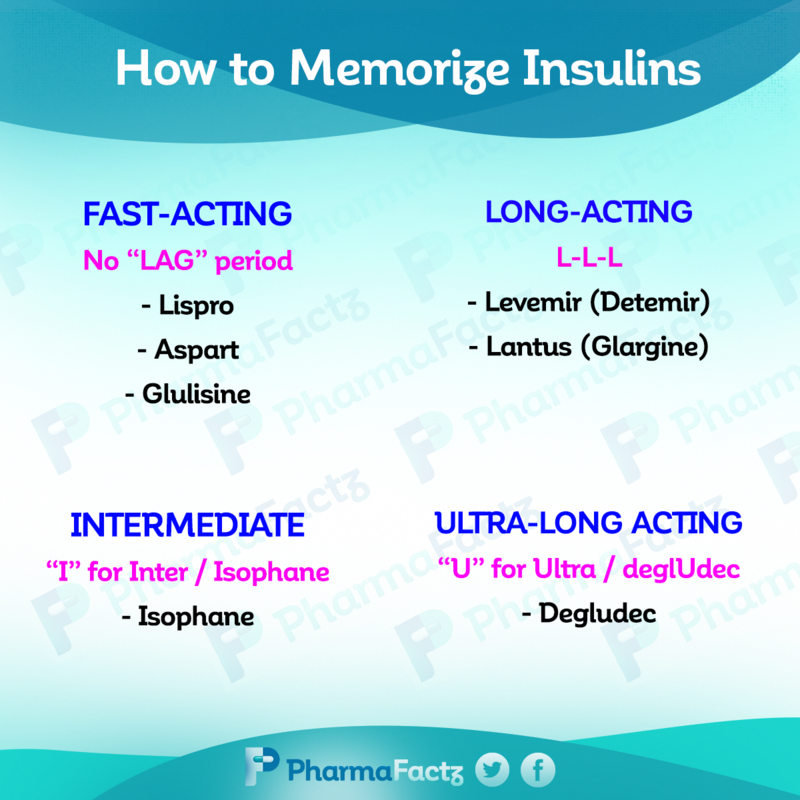 First, we begin by reviewing insulin – its mechanism, side effects and therapeutic implications. Later, we assess the pharmacology of the five main categories of antidiabetic medicines – examples, mechanisms of action and side effects. Finally, we bring together our understanding of diabetes pharmacology by reviewing clinical considerations of both insulin and the five other antidiabetic drug classes. Type 1 diabetes – characterized by autoimmunity against beta-cells of the pancreas, cells that otherwise produce insulin – in other words, type 1 is characterized by a lack of insulin. Insulin must always be administered to treat type 1 diabetes. Type 2 diabetes – primarily caused through poor diet, obesity and lack of exercise; characterized by insulin resistance. Type 2 diabetes accounts for 90 percent of patient cases. The remaining 10 percent comprises type 1 diabetes, alongside other diabetic states – such as gestational diabetes. The first antidiabetic drug class we need to talk about is, of course, insulin. We’ll learn what it’s used to treat, how it works and what subclasses of insulin exist to help control blood sugar levels. Insulin can be used to treat hyperkalemia because, by its very nature, insulin sequesters potassium inside cells. Given alongside glucose, it means that long-term treatment measures can be sought while the patient’s potassium level is controlled. When insulin administration stops, potassium levels rise again. Administering insulin remains an effective short-term solution. Side effects with insulin include hypoglycemia and hypokalemia. Patients who repeatedly administer insulin at the same site may develop unappealing fat accumulation at that site. Insulin elimination is reduced in renal impairment, leading to an increased risk of hypoglycemia. Later, we include some therapeutic considerations that healthcare professionals should think about. In the meantime, let’s quickly review the primary antidiabetic drug classes and how they can help patients with diabetes. First, we begin with sensitizers. An orally administered drug, metformin is not associated with weight gain – unlike every other oral hypoglycemic medicine. It’s also a well-tolerated drug, mostly associated with mild gastrointestinal side effects and causing a metallic taste. Serious side effects include lactic acidosis and, with long-term use, vitamin B12 deficiency. Take a few minutes to learn more about metformin. Pioglitazone and rosiglitazone belong to the thiazolidinedione class, also known as “glitazones”. These drugs are typically second or third-line agents depending on how well the patient has tolerated metformin. Like the biguanide class, glitazones are sensitizers – meaning that they lower blood glucose by activating PPAR-gamma; an effect which tells genes to enhance insulin action. This leads to reduced gluconeogenesis in the liver and enhanced glucose uptake by skeletal muscle. Unlike metformin, they can cause weight gain. Bear in mind that rosiglitazone has been suspended by the European Medicines Agency (EMA) due to their concern of elevated cardiovascular risks. There are two generations of sulfonylureas. The first-generation includes older drugs, such as tolbutamide, which are less effective and associated with more adverse effects than their second-generation counterparts. The drugs listed above are all second-generation agents. Both sulfonylureas and meglitinides act to promote insulin secretion. They also act at the same target – namely, the potassium-ATP channel of beta cells. However, they act at different sites along that channel. By closing potassium channels, calcium channels open – leading to greater insulin secretion. Sulfonylureas cause dose-related effects such as gastrointestinal upset, hypoglycemia and, in rare cases, hepatotoxicity and agranulocytosis. Meglitinides are associated with flu-like symptoms, gastrointestinal symptoms and hypoglycemia. Both drug classes are linked to weight gain. They work very differently from the drugs we’ve discussed so far. Whereas biguanides, glitazones, sulfonylureas and meglitinides affect insulin sensitivity or secretion, alpha-glucosidase inhibitors have no such effect. Instead, they work by slowing carbohydrate metabolism throughout the gastrointestinal tract – an effect achieved by decreasing carbohydrate enzyme production. By slowing glucose metabolism, they reduce the risk of hyperglycemia. They have a comparatively lower impact on HbA1c values compared to other antidiabetic medicines. Side effects include increased flatulence, bloating and diarrhea. Peptide analogs, such as GLP-1 agonists, are also secretagogues – they promote secretion of insulin. GLP-1 agonists bind to the membrane receptor, encouraging insulin release from pancreatic beta cells. Most of the side effects of GLP-1 agonists are gastrointestinal in nature. Some patients experience headache and dizziness, too. Rarely for antidiabetic medicines, GLP-1 agonists are associated with weight loss. DPP is the enzyme that degrades GLP-1 agonists. By inhibiting DPP-4, these inhibitors work to encourage stimulation of endogenous GLP receptors – stimulating insulin release. They are not associated with weight loss. Patients are, however, at an increased risk of joint pain. They are also associated with headache, nausea and increased risk of heart failure. Glycosurics are medicines that promote the elimination of glucose through the urine. There is some evidence that SGLT-2 inhibitors are linked to possible cardiovascular events, but research is ongoing with a definitive conclusion yet to be reached. We have reached the end of our study on the various classes in diabetes pharmacology. We examined insulin, biguanides, secretagogues, alpha glucosidase inhibitors, peptide analogs and glycosurics. With these mechanisms and side effect profiles in mind, let’s turn our attention to the final part of our review – namely, clinical considerations. Below, we talk about some of the principal therapeutic matters you, as a student, need to think about. Of course, these considerations are not exhaustive. They do, though, provide a helpful introductory summary from which you can further build and strengthen your knowledge. That metformin is contraindicated in severe renal impairment. Caution is warranted in patients with liver disease due to the risk of lactic acid accumulation. Similarly, lactic acid may accumulate in patients with alcohol intoxication. Some drugs – such as prednisolone and some diuretics, loop and thiazide – oppose the effects of metformin. Metformin reduces blood sugar, whereas these drugs increase blood sugar. The same effect holds true for other antidiabetic medicines, such as sulfonylureas. That gastrointestinal side effects are common with metformin. These side effects are most pronounced at beginning of treatment. Patients are often started at lower doses, before titrating up to a higher maintenance dose. This helps to reduce the severity of gastrointestinal adverse effects. Patients undergoing X-ray procedures should inform their doctor that they take metformin. Metformin should be withheld before and for 48 hours post-administration of IV contrast media in cases where there’s a serious risk of renal impairment. That insulin clearance is reduced in patients with renal impairment, meaning the risk of hypoglycemia is higher. Antidiabetic medicines impact cholesterol and triglyceride levels. Some medicines – such as metformin – have a positive effect on LDL levels. Others, such as sulfonylureas, have no effect. Thiazolidinediones are associated with both higher HDL and LDL cholesterol. In contrast, SGLT-2 inhibitors increase LDL cholesterol. Both metformin and alpha-glucosidase inhibitors decrease triglyceride levels. Glitazones increase triglyceride levels. Thiazolidinediones are contraindicated in patients with heart failure. Members of this drug class – such as pioglitazone – are associated with an increased risk of both edema and heart failure. Thiazolidinediones are also extensively metabolized by the liver and can, in rare cases, cause liver toxicity. Monitoring for hepatotoxicity may be required. These drugs are also associated with an increased risk of bladder cancer. As we discussed earlier, diabetes will continue to remain a therapeutic burden in the years ahead. Students should have a comprehensive understanding of diabetes pharmacology – the various drug classes, how they work, what side effects they cause – and how, as a healthcare professional, you can draw these threads together to come to real-life, clinical conclusions. Want to learn more diabetes pharmacology? Register with PharmaFactz today to receive instant access to all the resources you need. In the meantime, take a few moments to join our pharmacy blog newsletter (above) to receive all the latest facts direct to your email!